Travis Barker and Allen Stone: What inspired you to be a musician? What Was Your Inspiration to Be a Musician? 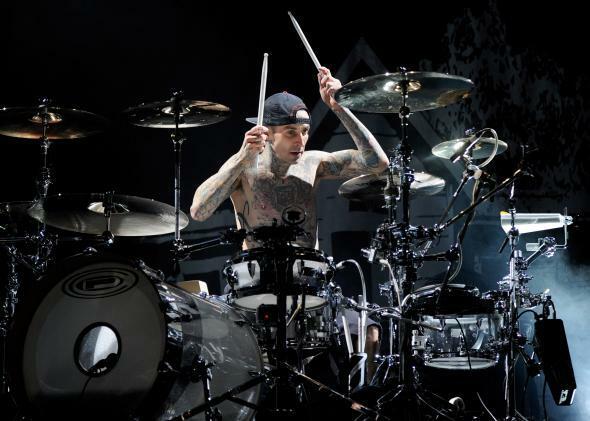 Blink-182 drummer Travis Barker performs at the Red Rock Casino in 2011 in Las Vegas. For me, it’s all I ever wanted to do. When I was 5 years old, I had this book I used to write in. When my mom asked what I wanted to do when I got older, I always said, “I am going to be a drummer when I’m older,” not “I want to be a drummer.” There was nothing that came along between the ages of 5 and until my mom passed away when I was 16 that I wanted to do more than play the drums. On her deathbed, my mom told me to play the drums. So, my future was mapped out for me. I remember being in high school, meeting with counselors who asked me what I was going to do for college. I told them, “1) My dad doesn’t have the money to pay for college. 2) I don’t want to go to college. 3) I’m going to play the drums.” The counselors would tell me it wasn’t an option, but I told them it was the only option I had. I didn’t have any other options. It was do or die for me. My pops would always tell me to have plan B, and plan B was an escape plan. I started getting tattoos and what I called “job stoppers” everywhere. I wanted tattoos, and I knew it would prevent me from getting a normal job. I positioned myself with my back against the wall so I had no other choice than to do what I absolutely loved. I think sometimes you have to do that. If you love playing the guitar, you love rapping, or you love producing music, you have to do it. That’s it. Don’t worry about driving a nice car or having nice clothes or a nice place to live. Just concentrate on doing what you love, and the good stuff will come. I think I decided to become a musician when I heard our family friend, Stacie Orrico, on the radio. I remember being in my dad’s baby-blue Buick Lasaber, driving on the freeway in our little country town and her song came on the radio, all the way out there. She was only 14 at the time. The second I heard her, I was like, “Whoa, whoa, whoa, what, what? !” We only get about six radio stations out there, so it was a huge deal, so when that happened, something clicked in my head, and I knew I wanted to do something great. If my friend, who was as human as I was, could do it and figure out a way to travel the world and sing her songs, then I could too. Maybe it was foolish pride at play, but when you’re a kid, you think anything is possible. At that point in my life, I had a real passion for music, and I loved singing. I had always done music with my family and started kind of writing songs and singing songs at social gatherings just to get attention. Truth is, I’ve been an attention whore my entire life. I would perform Green Day songs in front of my classmates to get girls’ attention, but then I realized there was something much bigger that I could do. Because my parents didn’t raise me listening to soul and R&B, I did my research. A friend introduced me to Stevie Wonder’s music, and something happened inside me where I knew I had found the music I was going to make. It made me melt, and it continues to make me feel alive when I listen to it. That’s not to say I don’t like other genres of music. I love a lot of different types, but there was just something about soul and R&B. I can’t explain it fully. A few months later, I was introduced to Stevie Wonder, Donny Hathaway, and Aretha Franklin, and it was all down hill from there. I was sold. What are the challenges I might face when I switch from electronic drum-kit to an acoustic drum-set? What is the process of writing a song like?